Once again I'm typing in advance of Monday on the off chance that Florence kills our power. I'm fairly certain that Florence has finally chosen her path and we won't have any hurricane related issues but it's always best to be prepared. And I think I've proven that it's even better to be over prepared. And over prepared I am. Enough bottled water to fill Lake Michigan? Check. Candles, matches and flashlights? Check. Extra gas for the stove, grill, generator and cars? Check. Liquor/wine cabinet filled to capacity? Check. Junk food supply too large to fit in pantry? Check. Hurricane reading materials available? Check. Special hurricane knitting project? Check. 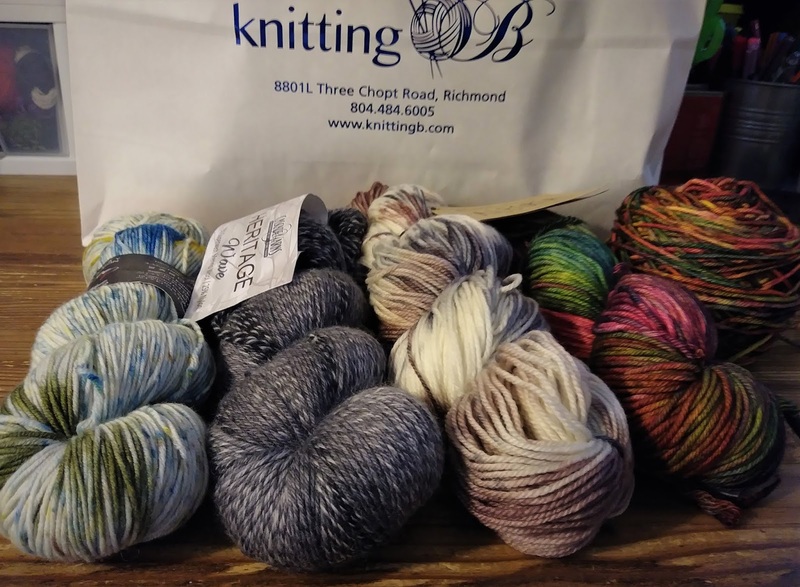 Hurricane knitting, reading and even junk food abandoned? Check! I've discovered North Carolina's shark cam and can not look away. I'm fascinated and somewhat lulled into an almost comatose state listening to the water and watching the fish maneuver through the currents. 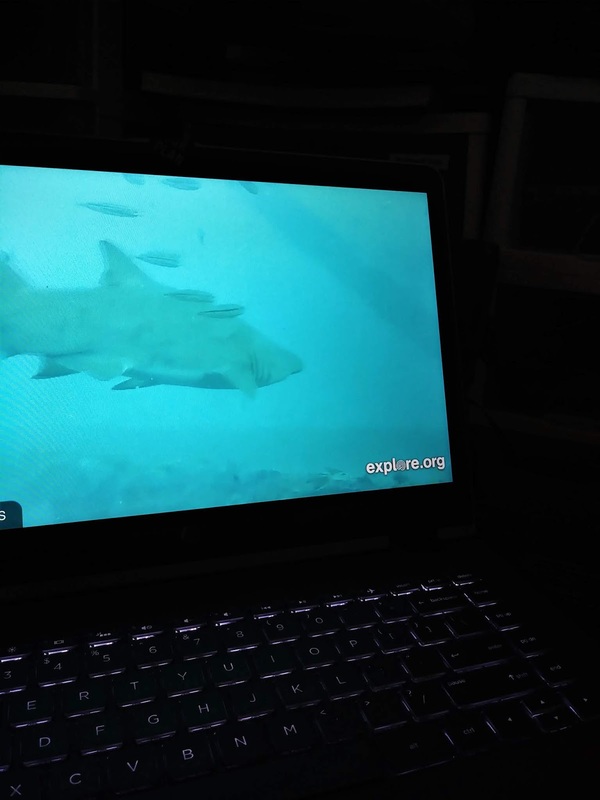 How did I not know this shark cam existed? I am SO excited to have found it. I've been wanting a large aquarium for years but couldn't face the expense or hassle of maintaining one. This shark cam is the perfect solution. For the past week I've been worrying about having enough food, booze and entertainment to get us through a power outage. It takes a LOT of food and booze to distract me from a lack of Netflix. But I've replaced my need for Netflix with the fish. It's going to take a very special knitting project to distract me from the fish! But once again, I'm prepared. While hurricane yarn shopping, I picked up a couple of skeins of Malabrigo Rios and a seed and rib stitch cowl pattern from a Noro magazine. I'm set! Between this lovely yarn and the shark cam, I may not even need junk food or booze to get me through the storm. You are too funny!!! But I can see why you upgraded on the yarn supplies, always important when natural disasters strike. Sharks, ugh, no thanks! I would never be able to go in the ocean again if I watched them. As long as there is chocolate, civilized life shall remain!!! We are supposed to get the remnants tomorrow. Oh joy! MORE rain. This has been the soggiest summer EVER! This summer has been the absolute worst! I feel like one giant mold spore. Stay safe - the remnants are still packing a wallop. We got hit with flooding rains and a Crazy number of tornadoes yesterday afternoon. You've got yarn so you have your priorities straight. We had a thunderstorm this morning and that was that. Thank goodness! That's good news! I can't believe they are saying the storm is reforming and may swoop around and hit us again. Unbelievable! Glad to see you have your priorities all lined up!! I had not heard of (or seen) the shark Cam, but I clicked and it is interesting (I did not happen to see any sharks thank goodness!!). I hope you are dry and enjoying power! 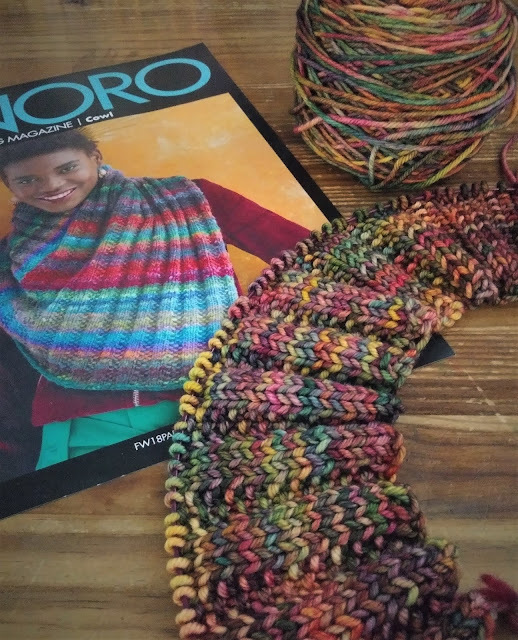 Rios is the perfect choice for comfort knitting! I am SO loving this knitting project! Rios is a delight to knit with.